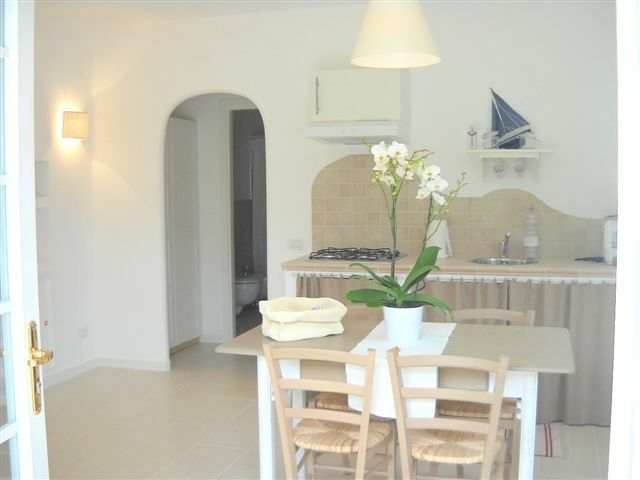 My apartment 'Maison Scisci', accommodates up to five people, is right downtown and near the sea. The kitchen-living room with masonry stove, where you can dine on old restored table called 'Kentish' once used to amass the bread! It has room for a comfortable sofa bed. From the niche leads to the sleeping area, intimate and comforting refuge from the subtle nuances blasted with a double bed and wardrobe and the possibility of additional single bed or cot for children. The bathroom with a large shower with mosaic travertine. The garden, very pretty, is furnished with a wooden patio, table and chairs for dining or having breakfast outside. Brick barbeque for entertaining braciate summer. Parking. • Requests made by mail or phone only have the value of 'required availability', the house is locked only for the customer at the time of receipt by us of the transfer / deposit by mail. • Upon arrival must be handed over documents (passport, identity card or driving license) for the registration and legal obligations. The balance payment if not already paid must be paid upon arrival in cash and will not be refunded for early departure. And 'right' of the owner to request upon arrival a 'deposit' of 20% of the entire reservation, which will be returned at end of holiday, except checks for damage or other problems caused to the property. Maison Scisci is currently not allowed to accept credit cards. • Keys: If you pay in cash, on arrival, the entire stay, you are handed the keys to the gate and the house where you will be accommodated (be careful not to lose the keys, replacing them costs $ 200.00 You will be fully charged). • Check-in: generally from 14.00, different times (quite flexible) should be agreed upon booking. Go to the structure without having notified about the arrival time can cause expectations. This problem can not be a reason for complaints or claims for reimbursement. • Check-out: strictly by 10.00. Different times are necessarily agreed with the owner of the property upon arrival. Damage: Any damage to structures made by guests, once found responsible, must be settled immediately. The regulation of the building requires silence in the time slot between 14. 00 and 16. 00 and between 22. 00 and 8. 00. However at any time, within the structure must be avoided behaviors, activities, games, sounds and using equipment that may disturb. • It is advisable to lock the door every time you go out for everyone's safety. • E 'prohibited the consumption of water from the pipes for uses other than those for domestic use, so it is forbidden to wash cars mopeds and motorcycles inside or outside the home, and disperse large quantities of water to lose on the road or in the sewer. • Do not bring other people in the rented structure than those of the booking of the house unless they are authorized by the owner. • Smoking is not allowed in the house. The bathroom equipped with every comfort with large shower in travertine marble. Posizione strategica: vicino a tutti i servizi e mare raggiungibile a piedi in 10 minuti a piedi su una strada ben servita di negozi. Casa ristrutturata di recente e studiata nei minimi particolari. Giardino magico....piacevole il rientro a casa dopo la giornata trascorsa al mare. Il proprietario Pietro è estremamente gentile e disponibile. La casa è situata molto vicino a viale Tittoni piena di negozi di ogni tipo. Per raggiungere il mare ci vogliono 15/20 minuti a piedi. La casa è molto comoda, accogliente, ben tenuta è piena di tutti i comfort. Grazie Cinzia è un piacere avere ospiti come voi! Spero a presto,Pietro. Pietro è un host davvero disponibile e la sua casa un vero gioiellino. Semplice ma curata nei particolari e arredata con gusto oltre ad essere molto funzionale anche per una famiglia con due bambini piccoli. Super consigliata! Torneremo sicuramente! Ha un giardino esterno perfetto per cene e BBQ che pirtroppo non abbiamo utilizzato perché siamo stati solo 2 notti. Tutto pulitissimo! Grazie mille, spero di avervi presto nuovamente ospiti! ideale per passare una vacanza in piena tranquillità. Curatissima nei dettagli con un grande giardino con alberi da frutta e posto auto. A due passi dal centro e dal mare. Torneremo con molto piacere. Nelle foto non hanno messo l accesso alla casa(un cantiere aperto)con calcinacci e polvere),le finestre non hanno tapparelle quindi luce e poca sicurezza può entrare chiunque ,il cancello aperto e comunicante con altra casa anche di notte,e proprietari invadenti presenti nel giardino affianco tutta la vacanza ,ma non doveva essere una vacanza di relax???? La proprietà ha un doppio ingresso carrabile. Il nostro giardino con zona bbq è ad uso esclusivo dell'appartamento. Le finestre sono in pvc con doppio vetro e zanzariera integrata; per la notte abbiamo dotato l'appartamento di tende oscuranti. Il "cantiere aperto" non è in realtà così, abbiamo dovuto fare un intervento di manutenzione urgente, per questo ci siamo scusati con gli affittuari del momento. Wir hatten einen sehr schönen erholsamen Urlaub. Our apartment 'Maison Scisci' is located in San Felice Circeo in the central area and only 10 minutes walk from the sea. San Felice Circeo is inserted in the national park of Circeo promontory known for his land of Ulysses and Circe, for its crystal clear sea, blue flag, for several years, 4 lakes, Paola, Caprolace, Fogliano, Monaci. Sonole multiple activities and excursions that you can do.